February 08, 2015, 4:27 p.m.
President Obama announced late last month that the White House will be pushing to expand workers&apos; rights to paid sick leave and family leave. Currently American workers have no nationwide right to paid sick leave, and unpaid family leave is only a guaranteed right in certain circumstances. The United States is one of only three countries without paid family leave laws, along with Oman and Papua New Guinea. Under the President&apos;s plan workers would have a federal right to paid sick pay and states would receive federal aid to establish their own family leave laws. YouGov&apos;s latest research shows that most Americans support requiring companies to offer various forms of paid leave. Requiring paid sick leave commands the highest level of public support (70%), followed by maternity leave (67%). Most Americans (55%) support requiring employers to offer paid paternity leave, but it is the least popular of the three paid leave laws, with 30% of Americans opposed to such a requirement. Republicans support requiring both paid sick leave (51%) and paid maternity leave (50%), but tend to oppose paid paternity leave, with 36% in favor against 49% who are opposed. 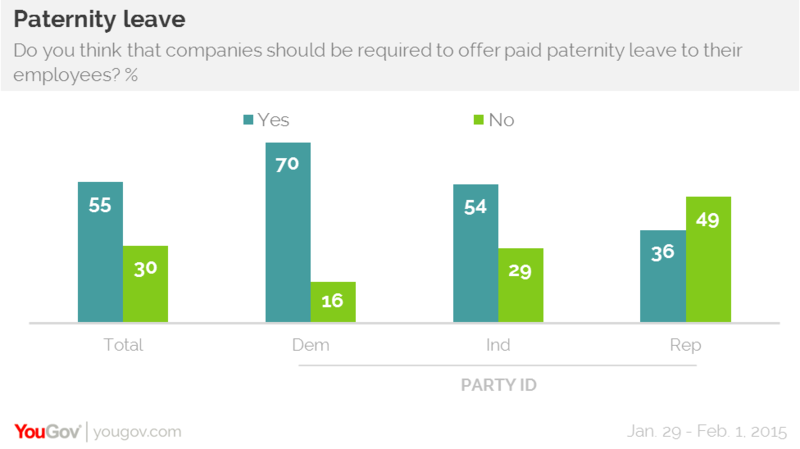 Most Democrats and independents support paternity leave as well as paid maternity and sick leave, with Democrats being particularly likely to back requiring employers to offer paid leave.